Here it is. Nov. 1987. I tossed the drapes and moved the ceiling fan into the sewing room. And painted it all white. And you can't see the ugly brown/beige carpet in this picture but that got tossed too. I now have hardwood floors. They are full of staple marks and have other problems, but they are wood. It certainly warmed up the whole house. Here we go. Nice white walls. There was a wonderful little shop a few blocks away that sold plaster. I bought a lot of Greek columns and topped them with glass. The chairs are mostly found cast-off secretarial office chairs I reupholstered in a bright blue textured vinyl. The wheels are great on the hardwood floors. And they are really comfortable. 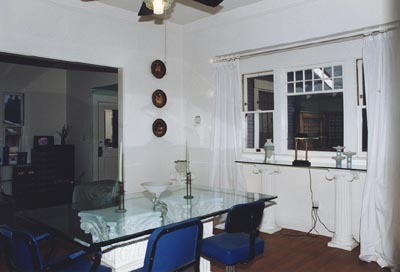 The dining table is a sheet of glass from a discount glass place as is the console in the window area. The design was inspired by the Greek plates on the wall that were given to me by my brother, and some great prints I bought and framed for the living room. I also found some wonderful acid-washed faux Greek and roman glass vases on sale at Aaron Brothers Art Mart. 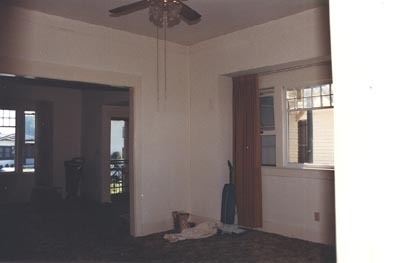 Here is the dining room from the opposite side of the room. You can see the black and glass ceiling fan. 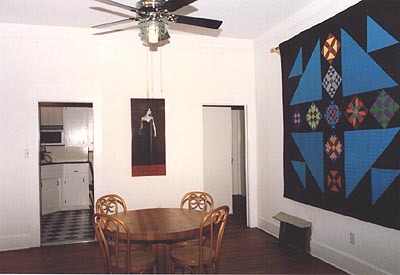 Also the quilt wall...the only wall in the house without an opening. And a framed print of a John Singer Sargent poster from the Metropolitan Museum of art. This is my old butcher block dining room table. I later moved it into the foyer area when I put the glass and plaster dining table in. I've since replaced it with a smaller white enameled aluminum garden set and sold the table and chairs. You can see a bit of the kitchen from this angle.